Here is the text of Walter Ruby's eulogy for Mel Brenner, delivered as part of a memorial service for our family member on June 27, 2013 at Jefferson's Ferry Retirement Community in Setauket, NY. I am Walter Ruby, Mel’s nephew by marriage. Sandy is my late father Stanley Ruby’s first cousin. Besides the familial connection, Stan and my mother Helga were lifelong dear friends of Sandy and Mel. They lived in different parts of the U.S. but sometimes vacationed together, in Shelter Island, California or elsewhere. I want to thank Janis, Amy, Leslie and their families and of course Sandy for giving me the chance to speak today. Like everyone here today, I am with the Brenners in their deep sorrow over Mel’s passing. Yet it feels appropriate today to accentuate the positive; to celebrate Mel for his sheer joy in life and the joy he transmitted to all of us with his effervescent personality, with his delightful sense of humor and love of people and nature. Let me start by sharing a sense of inadequacy for this task. The truth is that while I considered Mel my favorite uncle, I didn’t know him nearly as well as I would have liked. When I was 6 years old, my family left Massapequa Park where we had lived for a year, and moved west to Pittsburgh, Pa and later to Chicago. 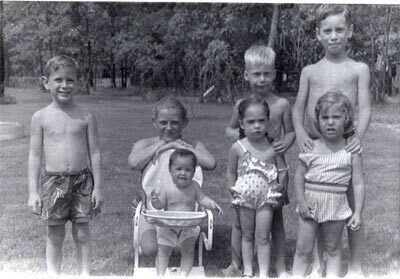 So during childhood we saw Mel, Sandy and girls no more than once a year and often less; when we would travel to NY to visit the family or when they would stop off and see in Chicago while driving around the country in their RV. Later once I was an adult and living in NYC I saw Mel and Sandy occasionally, often on family occasions—they were at my second wedding in 1983, at Joan Felenstein’s funeral and we had several memorable visits to their Massapequa home, especially one in 2006, when we took a lot of photos and put it up on our Ruby Family History blog, including cardinals and other beautiful birds lining up at Mel’s bird feeders. And then of course, I took a trip to Rhode Island last summer with Mel for the annual reunion of his 87th U.S. Army Infantry Division—where he served as infantryman in World War II, from the Battle of the Bulge across Germany to the Czech border the day the war ended. I will come back to that in a minute. When I think back to childhood encounters with Mel, I have few specific memories just a sense of ease and fun of hanging out with him. I remember a wonderful visit to Long Island when I was 11; together with my parents and my siblings, Danny and Joanne, we were about to depart on our year long sabbatical year in Israel where my father was a visiting physicist--sitting on the floor in the living room of Joan’s house in Rockville Centre showing Mel my baseball card collection of which I was immensely proud. I believe I left them with him for the year, so I wanted to make sure he knew what he was getting. The point is that he was the kind of grown up who could get on the floor with a nephew and flip baseball cards—and feel completely comfortable. I could see how he must have been a marvelous teacher. In fact, the experience of our round trip drive to the reunion and back including two crossings from Orient Point to New London and back and the experience of the it indeed turned out to be great fun, but much more than great fun. It was getting to know Mel really well, and to learn not only about his life experiences, but somehow a wonderful affirmation of life itself. Honestly, it felt like one of those 70’s road dramas about cross-cultural bonding with a Jewish sensibility—something by Paul Mazursky like Harry and Tonto. One thing that made Mel genuinely angry he showed me on the return trip; a hidden slave graveyard in Orient Point almost no one knows about…Mel showed me where it was…pointing out that few people are aware that slavery continued to exist in New York State well into the 19th Century…one could see the graves of the Lord and Lady of the Manor with their birth and death dates marked and around them some little stones without inscriptions were 5 or 6 slave graves looking like pet graves. How was such a thing possible, Mel demanded, in a country dedicated to the premise that all men are created equal? He loved this country and risked his life for it, but he wasn’t about covering up the blemishes. On the trip up, I debriefed Mel on his experiences in the war; how he went to school to be in an elite technical unit, but how it was disbanded and he ended up in the infantry instead, about his baptism of fire in the Bulge where it was so cold that when they slept outside in their sleeping bags it was so cold that the sleeping bags froze to the ground and they had to slither out of bed in the morning and then cut the bag loose with a pocket knife. Mel told me about seeing friends killed before his eyes and about the random quality of who lived and who died and about his own close calls; how he was once blown high into the air by a shell and somehow came down unharmed. Mel recalled how on several occasions he, the only Jewish member of the unit, had talked other members of his unit out of shooting to death German soldiers they captured; that not only was it morally wrong and might besmirch the reputation of the unit, but if found out on the German side, it would discourage soldiers and civilians from surrendering. On one occasion, Mel had to summon all his self-control to prevent himself from shooting a teenage member of the Hitler Youth who had fired at him from a house. Even amidst the horrors he was immersed in, amidst a psychology of ‘kill or be killed’ Mel’s quiet voice of conscience never left him. On that trip also I learned a lot about other parts of Mel’s life, including his political activism; his deep involvement in Democratic politics, including his unsuccessful campaign for a seat in the New York State Assembly in 1970 and the excitement of serving as a McGovern delegate to the Democratic Convention in 1972. Concerning the prior experience he talked to me about what it was like going door to door and asking for peoples’ votes in the most solidly Republican area of Long Island. He said he knew his chances of actually winning the election were slim, but he enjoyed the experience greatly because he loved retail politics and he was glad to have the opportunity to share his passion for liberal ideals with people. As he spoke I was struck by how little personal ego seemed to have been involved; that for him—and for Sandy, who was also deeply involved in Democratic politics--it was really about leaving the world a better place than they found it. Mel believed fervrently in free speech and was a founder and past president of the New York Civil Liberties Union-Nassau County Chapter. The last time I saw him about a month before his passing at a modern dance performance at Julliard, including a dance piece composed by his daughter Janice, a dancer and choreographer of whose career he was immensely proud, he told me that he a bit down to see that with all the work he and so many other wonderful people had done over the decades, the political situation in America and especially the state of civil liberties was no better than it had been 50-or 60 years ago, when he first got politically active. Had it all been worth it, he wondered, had anything really been accomplished? Janice, who was standing with us, and I assured him with considerable conviction that without the work that he, Sandy and other activists of their generation had done, things would be considerably worse. I hope that gave him some solace. When thinking of Mel, I come back all the time to the hackneyed, but terribly apt phrase, “A life well lived.” He did it all, pretty much everything he wanted to do in his life, a beautiful family, a successful and emotionally satisfying career, including a glorious 30 year retirement during which he rode his bike across France on several occasions and many other wonderful trips. He was witty, charming and incredibly kind. He gave so much more than he took. He left the world a better place. What more can one ask of life and what more can one ask of a human being? Mel, we miss you and love you. Joanne and Walter have been talking for some time about the possibility of Helga's descendants having the option of obtaining dual German citizenship based on Helga's status as a displaced former citizen. I have regarded that possibility with skepticism, but prompted by my latest health insurance woes my two siblings have gone to the trouble of learning the German law. Walter spoke with an official at the German consulate in New York and found that all the relevant information is here. The applicable law reads: "Former German citizens who between January 30, 1933 and May 8, 1945 were deprived of their citizenship on political, racial, or religious grounds, and their descendants, shall on application have their citizenship restored." Between January 30, 1933 and May 8, 1945 there were basically two laws pertaining to the loss of German citizenship. With the 'Law on the Revocation of Naturalizations and the Deprivation of the German Citizenship' of July 14, 1933, some persons were deprived of their German citizenship individually. Their names were listed in the Reich Law Gazette ('Reichsgesetzblatt') and with the publication of the particular Reichsgesetzblatt they lost their German citizenship. The main group of former German citizens, however, lost their citizenship with the 'Eleventh Decree to the Law on the Citizenship of the Reich' of November 25, 1941. This stipulated that Jews living outside Germany could not be German citizens. This mainly affected Jews who had left Germany in the years before or shortly after the beginning of the Second World War. I recently came across a listing of our Aunt Hilda, Elly's sister, having her citizenship revoked by name, but the second paragraph is the one that would apply to Elly Ringel and her daughter Helga. Walter writes that the official told him that if we have the proper documentation (and we do), then we could become citizens of Germany and of Europe within a year of filing the application. What that means for any of us Rubys remains to be fully considered, but it is certainly interesting to understand that acquiring European citizenship (presumably without renouncing U.S. citizenship) is a realistic option for any of Helga's children and grandchildren.